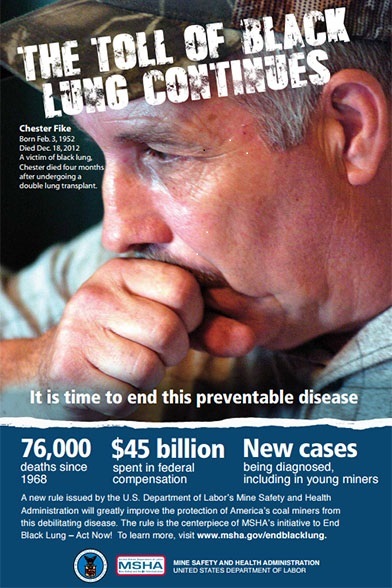 MSHA - End Black Lung - Act Now! for an end to black lung disease. We are here now to finish the job." On August 1, 2014, MSHA’s landmark respirable dust rule went into effect, adding a number of increased protections for coal miners and closing several loopholes that masked their exposure to unhealthy coal mine dust. Respirable coal dust sampling results for the first year of the rule—containing those new protections—show that compliance is achievable and, most importantly, that the nation’s coal miners are now, more than ever before, better protected from the debilitating and deadly black lung disease. The rule took effect August 1, 2014, with some components phased in over the following two years. Proposed in 2010, the rule builds on years of research and was developed with the input of industry, labor, and health professionals. It is the centerpiece of the agency's campaign to end black lung, launched in 2009. Archived Webpage for End Black Lung – Act Now!